Breast Friends are always extremely grateful to all those who support us, whether this be through small or large donations, organising events, taking part in fundraising events or sponsoring those who do. Thank you all. 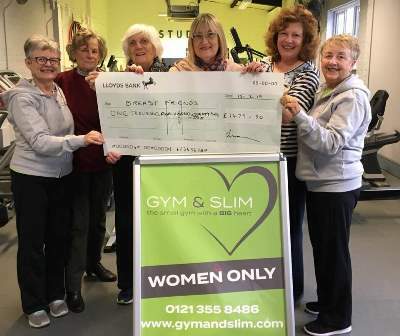 Breast Friends were privileged to be nominated as charity of the year by the women-only 'Gym & Slim' in Boldmere. 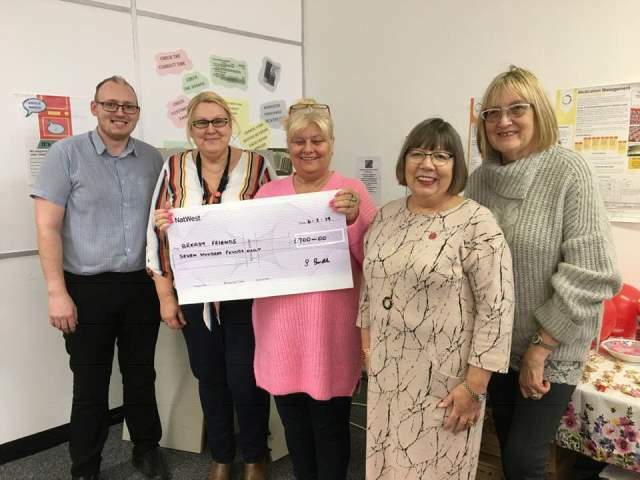 On Friday 15th March 2019 Jackie was presented with a cheque for £1,470.50 which, with gift aid, will benefit Breast Friends by a fantastic £1,885.19. We send our grateful thanks to Shirley Burns and all her members for making us their charity of the year and for raising such a wonderful sum for Breast Friends. Many thanks to Shani Smith and the staff of Custom Care at the Saturn Centre Ettingshall for a fantastic donation of £700. The photo shows Jackie and Nita with Scott Wright, the Regional Manager, Karen Magness, Branch Manager and Shani Smith, Care Coordinator of Custom Care. ​On behalf of our patients. Breast Friends sends a big thank you to everyone involved in raising such a big sum for our Charity. Our heartfelt thanks to Karen Roberts, who raised a fantastic £3,492.50 for Breast Friends through organising this Charity Day. Karen wrote on her 'My Donate' page: "I lost my Mom to Breast Cancer in November 2016 after battling this terrible disease for three years. During this time the cancer had spread to the bones, liver and lungs but Mom continued to fight, she was known as Rocky Momma as she just wouldn’t give up her fight. "I’m raising funds for Breast Friends as they are a brilliant charity and they really do help women cope emotionally and practically... Breast Friends thank you for the support you gave my Mom I wish she could have visited more but when she did it lifted her incredibly". Thank you Karen for such an amazing effort - a lasting tribute to your Mom, Bridie McGuinness that will go on helping others in the future. 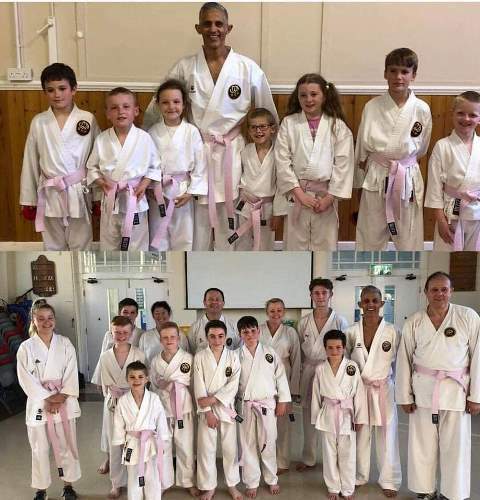 Jason Smith and his karate students raised £150 for Breast Friends by selling Pink Belts and wearing them through the summer of 2018. Breast Friends would like to thank member Sara Meddings and her friend Pat Wright for organising a wonderful evening at the Chennai Indian Restaurant on Clarence Road on 3rd October 2018. Sadly Sara was too poorly to attend herself but all her friends and Paul of the Chennai Restaurant were so generous that a fantastic £2400 was raised for our charity. Postscript: Sara was taken from us on 30th October 2018 and our thoughts are with her family. We remember you with love Sara. We all had a lovely time at Joan Fairley’s garden party at Woodside Farm in September 2018. A fantastic £2,400 was raised for Breast Friends Specialist Women’s Support Service at St Giles Supportive Centre, Sutton Coldfield. Joan was so impressed by the help the service provides for women coping with cancer that she wanted to help. Breast Friends and St Giles are very grateful to Joan and all her trusty helpers as seen in the photo with members of the Breast Friends Committee. Breast Friends are grateful again to Bev Dabbs, and colleague Debbie Guest, whose Fit Steps Charity Event on 19 July 2018 raised a wonderful £540 for us through an evening of dancing and laughs, with raffle and cake sale. Thank you to Bev, Debbie and all the girls for your continued support. Thank you Lynne and Paul Archer for hosting your Afternoon Tea Party in your beautiful gardens on July 15th 2018. £3,000 was raised, which will be split between Breast Friends, Sutton Cancer Support Centre and the local church at Wishaw. Breast Friends are very grateful to 'Pink' Hair Solutions for putting on a spectacular Charity Event and catwalk show, which raised a fantastic total of over £10,000 for us. Thank you to Linda and Emily Heeley, Levi Harrison and the staff of Pink for your hard work and generosity, organising such a fantastic day. Thank you to all the beautiful models, who put on a stunning show. To all stallholders including Joy Wright and Sandra Jones, for your support, and Gillian Cox for organising the tombola. To all sponsors for providing the amazing raffle prizes. Lovely singer Victoria and her hubby, the wonderful Carol who had her head shaved, raising £1000! To 'Michael Jackson' and 'Mrs Brown'. The caterers who provided the most excellent buffet, the fab DJ, and every single person who attended. Also well done to Linda Heeley on her sponsored swim raising £1297.50 for Breast Friends. Breastfriends were delighted to receive a £200 donation from the Midcounties Co-operative Society in April. Breast Friends are exremely grateful to McDermotts Building and Civil Engineering of Aston in Birmingham. The Breast Friends Charity was nominated by their site administrator Laura Johnston who was a friend and carer of our much loved member, the late Maria Simmonite.